Girl Scout Danielle visited The Green Cross cannabis club in San Francisco to sell Girl Scout cookies. What's cooler than a Girl Scout selling cookies? A business-savvy Girl Scout who sets up shop outside a cannabis clinic to rev up her sales skills. 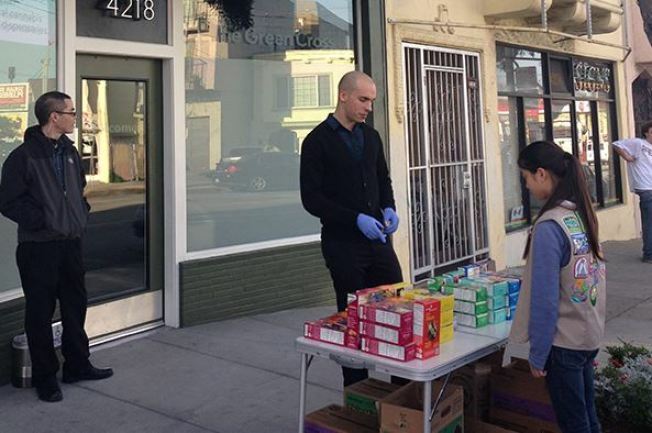 Thirteen-year-old Girl Scout Danielle Lei did brisk business last Monday selling Dulce de Leches and other flavors outside The Green Cross medical marijuana clinic in San Francisco, Mashable reported. Danielle was able to sell 117 boxes within two hours outside the cannabis clinic -- 37 more than what she sold within the same time frame at a local Safeway the next day, according to Mashable. "It's no secret that cannabis is an appetite stimulant -- so it's not shocking that a lot of our patients came and purchased cannabis, and then saw the cookies and purchased them," said Holli Bert, a spokesperson for The Green Cross. "But it wasn't just patients, staff members and neighbors also bought the cookies. I personally bought five boxes. It turned out to be a big success." Bert said that Danielle's mother had contacted The Green Cross to set up the sale outside the store. "We were happy to have her (Danielle) come -- she is extremely business savvy," Bert said. Danielle's mother Carol takes her two daughters to different places around San Francisco to sell cookies so that "they can learn about different environments," Mashable reported. Carol told NBC Bay Area that the family is not doing any interviews. Green Cross is so happy with the outcome that they have invited Danielle back to their store on Saturday, Feb. 22, from 4 to 6 p.m. for a repeat performance. The Green Cross posted about Danielle's visit on its Facebook page, including a link to an external poll, which asks people whether Girl Scouts should sell cookies outside legal marijuana shops. The Girl Scouts of Northern California don't have a problem with this business strategy. Dana Allen, the organization's marketing and communications director, told Mashable that "the mom decided this was a place she was comfortable with her daughter being at." "We're not telling people where they can and can't go if it's a legitimate business," she said.